In 2014, the U.S. Geological Survey (USGS) National Water-Quality Assessment Program (NAWQA) is assessing stream quality across the Piedmont and southern Appalachian Mountains in the southeastern United States. 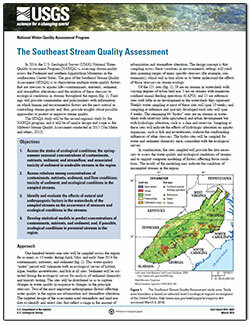 The goal of the Southeast Stream Quality Assessment (SESQA) is to characterize multiple water-quality factors that are stressors to aquatic life—contaminants, nutrients, sediment, and streamflow alteration—and the relation of these stressors to ecological conditions in streams throughout the region. Findings will provide communities and policymakers with information on which human and environmental factors are the most critical in controlling stream quality and, thus, provide insights about possible approaches to protect or improve stream quality. The SESQA study will be the second regional study by the NAWQA program, and it will be of similar design and scope as the Midwest Stream Quality Assessment conducted in 2013 (Van Metre and others, 2012). Van Metre, P.C., and Journey, C.A., 2014, The Southeast Stream Quality Assessment: U.S. Geological Survey Fact Sheet 2014–3023, 2 p., https://dx.doi.org/10.3133/fs20143023.